La’Darious Wylie, 11, and his sister Sha’Vonta, 7, were waiting for a school bus near their Chester, S.C., home Oct. 27 when a car veered off the road. 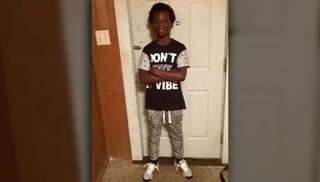 La’Darious pushed his sister out of the way and was struck by the car. La’Darious was rushed to a local hospital, where he died the next day from injuries suffered in the incident, WBTV reports. La’Darious will be laid to rest Thursday. The news station reports that a makeshift memorial now rests in the spot where the fifth-grader was struck, just yards away from his family’s home. La’Darious’ mom, Elizaberth McCrorey, told The Herald that the boy’s organs have been donated so that other children may survive illness or injury. Michelle Johnson, 57, was charged with felony hit-and-run resulting in death. If convicted, she could face up to 25 years in prison. According to Fox 5 DC, Johnson is out on bail after posting $25,000 bond last Friday.